Undoubtedly Ireland’s number one tribute show ever. Abbaesque’s success in Ireland over the past 13 years has been phenomenal. They are without question Ireland’s most successful tribute show, performing in excess of 250 sell out shows each year throughout the entire country. Headlining Dublin’s 11000 capacity Point theatre on New years eve 1998 and playing Saturday night residencies in the capitals prestigious Olympia theatre demonstrates the level of success enjoyed by this spectacular show. 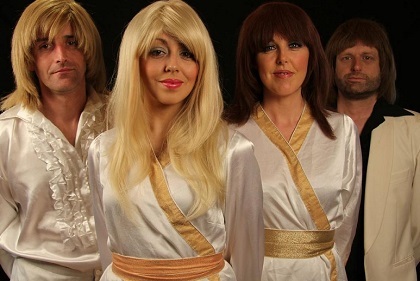 As well as numerous TV appearances, Abbaesque have also performed at all of Ireland’s major festivals including the internationally renowned Rose of Tralee festival playing to ecstatic crowds of more than 10000 per night. It’s a combination of energy, excitement and great entertainment together with consumate musicianship and a painstaking attention to detail that set Abbaesque apart from the rest. To book Abbaesque for your event or to talk to us about your corporate event requirements, either submit the enquiry form, email us: info@carolandassociates.com or call us on 087 718 1360.